Having moved to The Other Florence on the Oregon Coast last year, better known here in Nofendersville as Thee Utter' Florence! Not to be Cornfuzed with Italy; Hya! My Florence Car Show "Handler" Colin picked me up around 2:15PM, so we were casually "late" to the Car Show, which turned out to be fine, since there were still plenty 'O vehicles to Gawk At. Although it was pretty much basically a wash for Mwah. Being perfect Car Show weather, 65deg-f, although the humidity was some 75%+, yet that Darn Blasted Bright thingy in the Sky made it virtually impossible for your Blind Word Hack' to see any of the vehicles in fine detail! 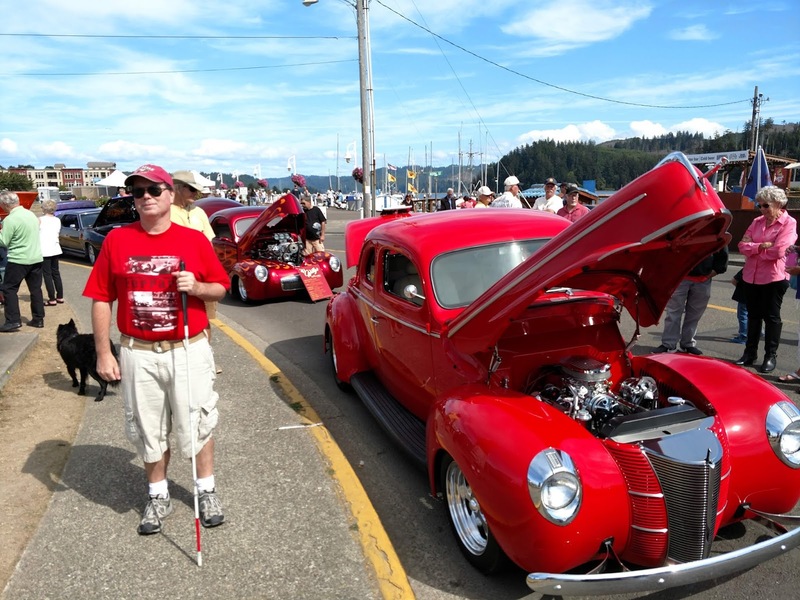 Pretty sure the very first Rod' we laid "Eyes" upon was that nicely done '41 Buick Hot Rod,. Since I remember the owner telling me it had a 430cid Big Block Buick V-8 "Shoehorned" in it. Then we briefly took in Doce' '41 Willys Jeeps, noting that I thought one was a Coupe? Especially since I've got a soft spot for AmX's & Javelin's, specifically since some Dude named "Captain America," nee Mark Donohue made 'em famous during the early 1970's in SCCA Trans Am racing with El Capitano', nee Roger Penske. 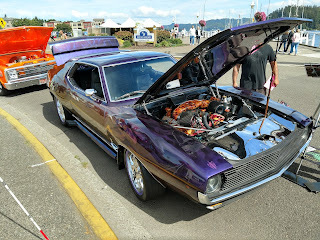 Although according to my maiden rods 'N Rhodies Car Show outing Wayback in Twenty fourteen, this BASF mystic paint colour was for the limited edition '96 Ford Mustang, with a scant 2,000 units produced. Next we, Whale' Otay, Mwah - Spent considerable time Droolin' over one of my personal favourites, a RADD' 1969 black Mach 1 Ford Mustang. With me asking Colin several questions, in order to discern it was a Big Block with a Shaker hood. ARSE-Sumedly a "Police Interceptor" 428cid V-8 lump? And 5-spokes "Magnum 500" wheels, plus Automatic transmission. Whilst think it also had the de riggour rear window "Slats." Then we briefly stopped at another FoMoCo' (Ford Motor Company) product. a nicely done '68 Mercury Cougar with vinyl top. Think it was white with black vinyl top? Somewheres' past the '41 Ford, as we stopped to have Colin read me the next vehicles window info-card', while I stood attentively with White Cane in hand. A man stopped alongside me and said, sure would be nice to rub some vehicles... Huh? Then he told us a story, or more likely Yarn straight out of that wonderful movie A Scent of A Woman. He said he had a friend in the military who went Blind. They took real good care of him Disability-wise. In fact so good he was able to buy a Ferrari! Because he loved Cars and loved running his hands over them. Before he leaned closer to my ear and said he was just telling me a Story, before wishing me a Good Day; Blimey! Next, we sauntered past lotso '37's, mostly Chevrolets. A '33 Ford "Deuce" Coupe, (3 window) a 1955 Chevrolet 210 Station wagon. A 1974 Vega Kamback and a 1954 Bel Air. Or was it a '54 Bel Air Station wagon - Nomad? Quite a few PickemUp' (Pickup) trucks On-hand, mostly Pre-war. Multiple '41 Fords abound. One being a two door coupe pulling a matching "mini" trailer behind it which Colin sez' looked more like a Sidecar. Then behind it was the owner sitting atop a patch 'O grass, at a picnic table with pop-up sun "umbrella" awning. Believe the car and trailer were orange, since Colin thought it was the colour of the man's shirt initially, before saying it wasn't. A 1937 Chevrolet Cabriolet momentarily caught thou Attenzione. And there were two Chevelle's we stopped at. The first being a 1964 SS, with the second being a '68 Baby Blue SS 396. Since Colin told me it's got racing stripes running down the hood, roof etc. Presumably a la Shelby GT Stripes. Along with telling me it said 427 on hood & front fenders? And then it's rear "Slats" were carbon fibre according to Colin. Also Thar was a '67 Ford GTA, presumably a 390cid V-8? As it and the second '69 Stang' were both "Hunter" Green, a la that famous Bullitt paint colour. 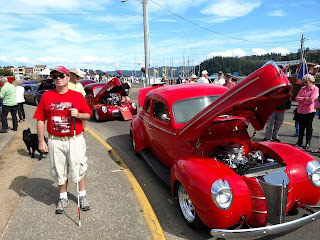 But I'd wanted to Exit Stage Left before the end of the show at 4PM, since there was to be a Cruise thru Oldtown beginning at 4:15PM and I just didn't want to be assaulted by the cacophony 'O multiple Hot Rodders wrapping Thar L-O-U-D Pedals! As they fired up there assorted vehicles; BRAPP-BRAPP-BURR-RAPP!